These ratings prove helpful while buying the product, to help in correctly selecting the machine that is needed by the user, depending upon his usage and requirement, he can choose the appropriate rating for his work. It also differentiates between the manufacturing companies and the efficiency of generators that the company produces and how reliably those ratings are fulfilled by those generators. The thing that should be remembered is that the ratings of the generators are usually expressed in Kilo Volt Amperes i.e. KVA and this is conventional for all energy supplying devices as well, such as transformers and UPS’s as well. A motor is similar in construction and working principles to the generator, but it is rated in Kilo Watts (KW). 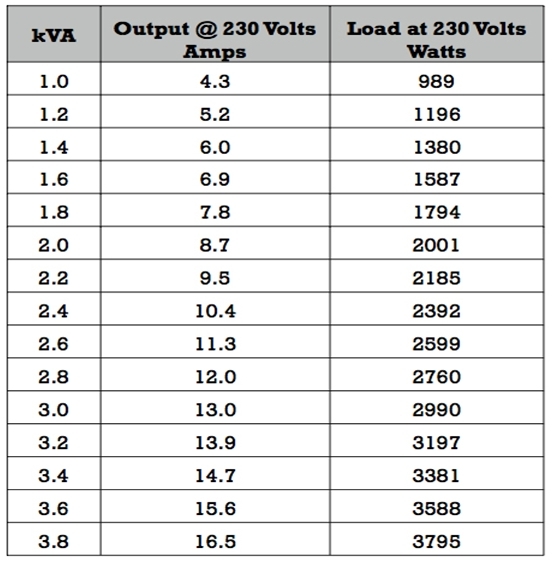 This is due to the fact that KW represents real power whereas KVA represents the apparent power output of the device. And as far as the energy supplying devices are concerned, their power factors depend on the load that is being attached to them, and hence the real power can never be predicted accurately. So in the apparent power, the power factor is approximately taken as one. Standard rating definitions are set by the International Standards Organizations (ISO), so that the comparison between different manufacturing companies and their equipment become easy, when all have the same standard parameters. For the same rating, a generator can deliver more power at the output if used for a lesser time duration, than the one used for more time duration. The Generator set is capable of providing emergency power at times when no other source is available. Its power providing duration can be up to 500 hours for an entire year. The power factor for a stand by power rating should not be more than 0.7. Prime rated power is capable of providing the power for an unlimited time period to a varying load. Overload is also allowed but only ten percent of the rated value and that is also permitted to only once in twelve hours. This rating offers the option of a more varying load, but only with an average load factor. In this rating, the generator can again provide a power supply for an unlimited period but only to a non-varying load. But the average output power comes out to be between 70 to 100 percent of the rated power output. The load should be “relatively steady”, which means that there should be no significant variations in it, otherwise the prime power rating could be a better option to consider. Also any overload capability is not available. If a prime rated generator is applied to limited power ratings, then it can be used in a parallel with the utility, and can run for duration of five hundred hours in a year. It also does not allow the over load capability of ten percent of the rated power. In the next post of this series, we will put some light on another type of generator, which is called Direct Current Generator. Direct Current generators are very rare to found but have unique applications. They are quite similar to synchronous generators in operation with slightest difference which we will see in detail in the next post. Till then, take care and if you want to write an article for the ECC blog just like me, simply send a mail to the team. or copy this trackback: http://engineering.electrical-equipment.org/electrical-distribution/generator-ratings-back-to-basics-2.html/trackback from your own site. The first part of the current article is not to the point and misleading. That is it can give as maximum 0.8*X KWATTS, Which is the maximum real power (KW) it can give at a time. So if your overall P.F. of your installation is 0.8 you can reach the KVA rating of your generator plate as maximum load (taking into acount to stay a 70% of generators rating in average during lifetime of generator), however if your installation is of unity Power Factor for example you can only load 0.8*X KVA or KWATTS (X being the KVA rated power of the generator). thank you about this information but we need more of 3 phase gen.
if I want coupled 2HP, 1380rpm, 3.80Amp 3phase induction motor with dc shunt generator, then which factors i have to undertake for the selection of DC generator? how can i decide the ratings for better Performance? Wireless Power Transmission : a Myth or Reality?